I too love it, and I say the sleeves are always too short. And yet I love it. And you are knitting an entire suit. And summer is coming. And yet you are knitting an entire suit. Well, three weeks of warm weather shouldn’t make that much difference. When do y’all Open the Cabin? Cabin? They might be having Spring Furnace Wars, just like we are. It is a gorgeous sweater, but the only surprise is that you’ve waited this long to knit him one! What a beautiful sweater! And perfect wee buttons, too. Like Rams, I am… aware that summer is on the way. But the knitter in me says that even then there will be windy days and chilly nights. There’s a while yet before high summer will strike, and a grammy has a job to do to keep the baby bunting warm, doesn’t she? I’m thrilled to see all these bits of knitting popping off your needles! I’d been feeling a bit low and unknitterly, but you never fail to inspire me, Oh Yarn Harlot! I can’t wait to see those baby booties all sewn up. I love knitting this pattern! I have it in the Knitting Workshop and I just love the comments she makes in various parts of the pattern “See what you are doing here?” “Funny-looking object, isn’t it?” She is great. Yours is wonderful and I just love your handspun yarn. Just finished up mine for our newest grandbaby due in early Fall. I love it too! I can also see how the booties are folded and seamed to become booties. Elliot must be growing so quickly, I hope everyone remembers to not blink as the time goes by so quickly! My firstborn will be 19 tomorrow…. Nope. Can’t visualize how those booties come together. I admit I was (and still am) enchanted by BSJ. I’ve just finished knitting the same hat you made for Elliott, which reminds me of the BSJ a bit, in that the “finished” knitted item looks nothing like a hat, until you seam it together. I am making the first “seam” grafted, hoping that it will be less bumpy for the baby’s head. 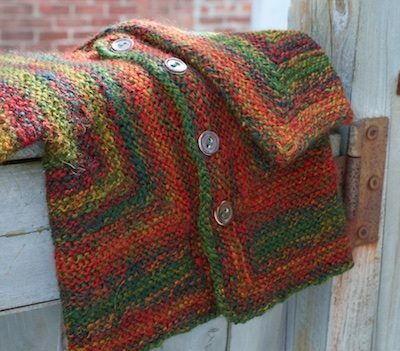 I love seeing all the wonderful items you’re knitting lately! I too love EZ’s original instructions, though I had to watch Meg Swanson’s video to “get” the first one. And I, too, am sorely tempted by the Complete BSJ book. My mother has requested a cozy bulky sweater just for curling up in when sick and I’m thinking the ASJ might be just the ticket. Might add a pocket or two. I know, right? I’m thinking of asking for The Complete Surprise for my upcoming birthday even though the original pattern seems perfectly adequate. Yours looks great, BTW. Bootees? Solid blue underneath, stripey sides and back of heel, red up the leg? Is that how it works? I say you put those buttonholes wherever you jolly well feel like. Buttons are not magic: people do not wake up mysteriously gender-swapped if they fall asleep under a full moon with their buttonholes on the other side – although that would be a fascinating idea for a fantasy novel. I once used a baby surprise ‘blob’ as a baby shower game, “who can figure out what it really is”. What a good idea! I will have to keep that in mind for my sister’s shower in the fall. That is a brilliant idea! Co-hosting a baby shower in 3 weeks – not enough time to knit one since I’m making a bunch of dish cloth “diapers” as favours. However – I think I might have one tucked away that isn’t sewn up – perfect! There will only be 3 knitters at the shower – me, the new mum and her mum – wonder who will figure it out? Dish cloth diapers? Tell us more. Pirate baby! Love the colors in the sweater. So cosy and homey. I agree 100% about buttons on clothes being put on the side that suits the person doing the dressing. So very glad to see it wasn’t the knitting that got squeezed out! 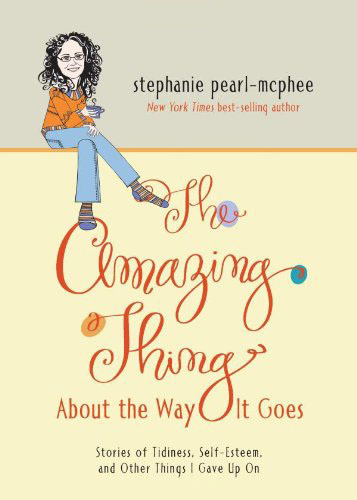 You had all my sympathy on the “something has to give” front. *The exceptions to this are your sock recipe and the patterns in my favourite EZ, “Knitting Without Tears” – doubtless because they are written in words. 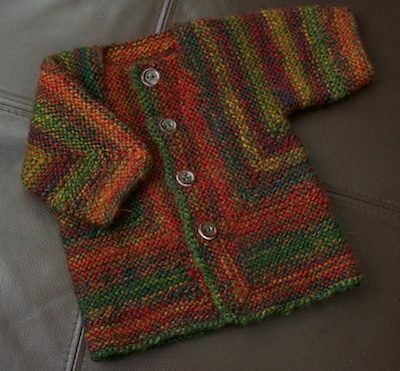 This summer, I need to sit myself down and read The Opinionated Knitter (which I bought last year) and knit a baby surprise sweater! And NOW you announce that there is another book? I might just have to buy that one too! I’m knitting socks… it’s really cold and wet in Ottawa. The sun is out today but it’s not yet warm enough. Elliot will look smashing in the BSP! Franklin Habit just reviewed “Complete Surprise ” and seemed to like it. I think I will order it. Sounds like Cully does a nice job of explaining the theory behind the pattern. Your BSJ is glorious , Stephanie, I hope we get to see it on the adorable Elliot. Love that BSJ, I have made a few since you introduced me to it years ago, for which I thank you. Please please explain how you managed those great stripes. Is it a result of the yarn’s coloring, or I did you change yarns to get them? I’d love to know! 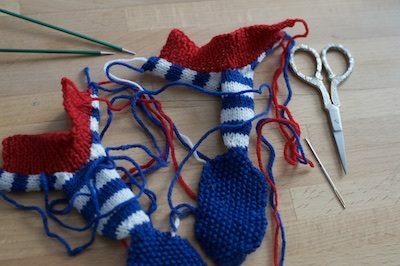 It was stripey yarn – so a stripey sweater resulted! You had me at PIRATE! I’m shocked you hadn’t made one sooner really. But it’s stunning nevertheless. I can’t wait for the pictures. Beautiful BSJ. It is like looking at a basket of gorgeous vegetables through wavy glass. I tried BSJ a few times and kept getting stuck – even bought the DVD. I must try it again – I so like how the stripes travel about. Thank you for sharing these happy baby clothes. Please please please more photos of your beautiful grandbaby! I’m having withdrawal symptoms from lack of baby photos! 🙂 I really must knit a BSJ. I never have and I love them, and EZ. I like the shorter sleeve on the original BSJ. I have knit many BSJ for grand nieces/nephews who are able to wear them for at least a year because of the short sleeve. I do, however, like the Icord edging and ties instead of buttons. I always have trouble finding just the right button for each sweater so eliminating the buttonholes is a nice option. 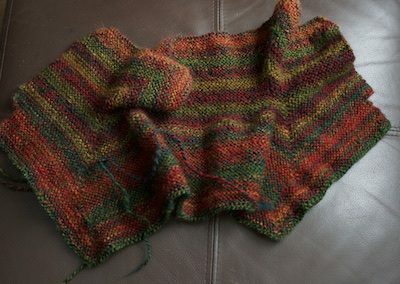 I do ribbing cuffs and then do the cast on stitches in between them, if I want longer sleeves on a BSJ. Then again, if you want g.st cuffs, you can just pick up from the wrong side of the sleeve stitches and knit down to add length. I adore EZ, have been a huge fan these 38 years or so, but even at that, nothing is graven in stone. By golly, if you don’t want a shorter sleeve, you don’t have to keep everything original. I seldom make five buttonholes as EZ recommends, and I see you didn’t either. I often go with three, while you seem to have plumped for four. As an aside to the sock-knitting lady, I too knit socks year-round, as I don’t think I can have too many and it’s one of the very few items I knit for myself. A bonus to spinning your own yarn, and in particular for me because I source my fleece locally, knitting socks in a down-type handspun results in socks that felt only minimally and can be both washed and dried by machine. OK, it’s not Merino, and if your feet crave softness, downs wool will make you dissatisfied. I’m not “allergic” and don’t care as long as my feet are warm. I make anklets and wear them with my runnies in summer, up to the point where sandals become de rigueur. Ok, I am waiting to be surprised to see booties be done because I do not see booties. I do see a lovely sweater and did check out the book because I like the sweater and an Adult sweater that is a surprise would be nice! I saw the BSJ suit photo on MDK yesterday and immediately thought “I wonder if The Yarn Harlot will knit one of those”. Can’t wait to see it! I too knit from the Opinionated Knitter. Just finished a BSJ and almost finished a tom ten. I have to make them every few years. No grandbabies yet but the hope chest is brimming..
am I the only one who finds the neck too small on the BSJ? I always cast it off a few rows early.